Family drama dealing with transgender issues. "Close-knit" (2017) is an emotional drama that deals with the issues of gender, identity and sexuality. Director Naoko Ogigami wished to draw attention to LGBTQ communities in a Japan society that is still largely conservative in outlook. Tomo (Rinka Kakihara) is a young girl living with her single mother. When her mother walks out on her one day, she calls on her uncle Makio (Kenta Kiritani), who agrees to take her in. On the way to his house, he tells his niece that he is living with someone, a woman who is special to him. 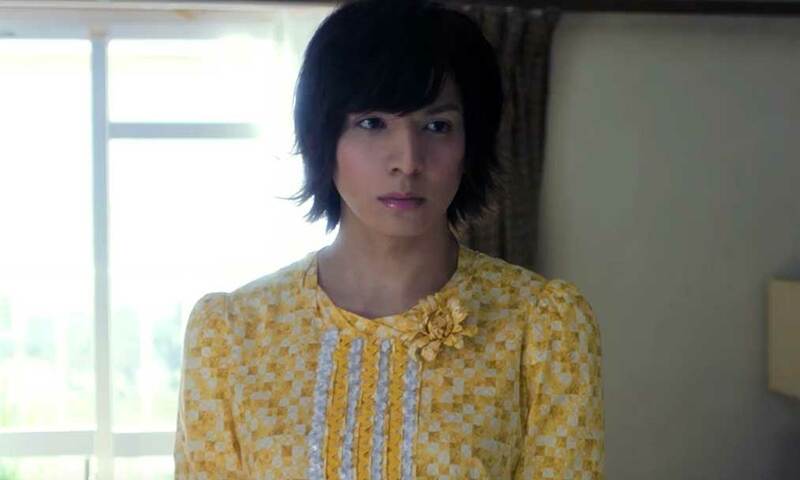 When they arrive at his house, Tomo is introduced to Makio's girlfriend Rinko (Toma Ikuta), who was born as a boy, but is part-way through transformative surgery to become a woman. Tomo is welcomed into their lives and finds the couple to be loving surrogate parents for her absentee mother. We learn a little about Rinko's history and decision to transition, and also about Makio, his mother who is suffering dementia and is in a home, and his sister. A secondary story involves Tomo's classmate Kai (Kaito Komie) who is also coming to terms with his sexual identity in a society where to be different is often to suffer segregation and bullying. Written and directed by Naoko Ogigami, the film is sympathetic to the plight of Tomo's classmate and Rinko is shown to be a caring girlfriend and mother. The film does not shy away from showing the difficulties associated with coming out or transitioning, in particular the bullying of classmates and attitudes of other people in society. We see examples of homophobic bullying at school as well as parents who are uncomfortable with Rinko. However, there are also many examples of kind, accepting people, such as the parents of Rinko and Tomo's classmate, who do everything they can to make them feel loved. For the most part it is a gentle drama, with little in the way of serious danger, violence, or anger directed at any of the characters. Instead, the film goes out of its way to show the normality of Rinko and Maki, their interactions together are endearing and there is clear affection between them that makes them clearly superior to Tomo's own mother who has walked out on her. Ogigami's direction is quiet and contemplative, chiming perfectly with the mood of the film. There is also a great visual style to the film. In one early scene, we see a selection of shots that manage wordlessly to tell a complete story about Tomo and her mother's life, immersing you in their lives without the need for excessive exposition. Throughout the film, there is a clear attention to detail when it comes to framing and location that adds a lot to the atmosphere. Rinka Kakihara gives an impressive performance as the young Tomo. She is expressive and instantly likeable. We see her go through a range of emotions, confusions, happiness, anger, sorrow, and all are believable. Toma Ikuta is also exceptional as Rinko, bringing both warmth and an underlying fragility to the character. His charismatic performance helps to bring the script to life and together with Kenta Kiritani as Maki, this trio creates a sense of family that makes you want to spend time with them. The other actor worth mentioning is Kaito Komie as Kai, the young boy struggling with his sexuality, who gives us an insight perhaps into Rinko's own childhood through the similarity of his situation. His is perhaps the most tragic story of all, feeling excluded from the world around him and not fully understanding his feelings of attraction for a fellow male classmate.The film relies heavily on the actors and every performance here is carefully considered, giving the audience an incredibly detailed story with either a look or a gesture. "Close-knit" is a family drama centred around the under-represented issue of transgender individuals. In that sense, it is an important film for bringing attention to these people and showing them to be kind-hearted and comfortable in their own skin. Everything about the film is done at a relaxed pace and apart from a couple of moments later on, there is no particular sense of threat hanging over the characters. Kai's character is a little underused as he gives us an insight into the struggle of learning about sexuality and being accepted by peers. His story is often sidelined to focus on that of Rinko, who seems well-adjusted and happy with herself. She has a loving partner, understanding parents, and forms a good relationship with Tomo, almost instantly. While some may criticise the film for being too mild regarding the subject matter, it is also praiseworthy that it never feels exploitative or sensationalist in its portrayal of the characters. Naoko Ogigami has created an engaging drama, with both direction and score contemplating the subtle performances. It deals with an important issue with the sensitivity and compassion it deserves, but above all creates characters with which the audience can relate. "Close-knit" is a film that brings you into its world and takes you on a quiet journey of discovery about family and identity.